WASHINGTON — Fruitive, a small fast-casual chain whose menu is 100-percent plant based, will open its second D.C. location Jan. 25. To mark the opening, the eatery is giving away free avocado herb toast and coffee starting at noon. 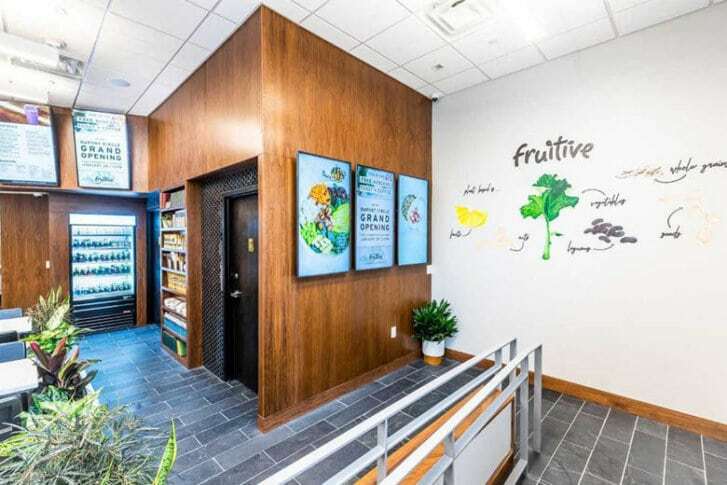 The Dupont Circle Fruitive is at 1330 Connecticut Ave. in Northwest D.C.
Fruitive opened its first location in 2011, and now has restaurants in Virginia Beach, Virginia, and Norfolk, Virginia. Its other D.C. location is at CityCenterDC. Dupont is the chain’s fifth location. Fruitive also sells its products at farmers markets in D.C. and Maryland. The eatery calls itself the first Certified Organic Fast Casual Restaurant in North America. The Dupont Circle location includes eight video screens as menus, and no point-of-sale counter. Fruitive’s staff instead will carry around iPads for payment transactions. The chain went cashless at all of its restaurants in 2018. The Dupont location’s menu is similar to the one at CityCenterDC, including smoothies it calls “liquid meals”; wellness shots such as ginger, turmeric and wheatgrass; overnight oats, superberry bowls; salads; soups; sandwiches; quesadillas and wraps; waffles and several versions of toast. Its avocado herb toast includes flax and spelt bread, basil pesto, oregano, sea salt and pepper.